When used as an ingredient or simply a garnish, edible flowers can be a boon for innovative cooks. They’ll add a fresh flourish of color and introduce unusual flavors to your dishes. It may be trendy, but it's nothing new. For centuries, cultures around the world have brightened their recipes by adding flowers. In Roman times, for example, roses were used for cooking and flavoring food. Rose water was also put in fountains and baths to help people freshen up. Flowers delight our senses in so many ways – sight, smell, touch – it's not surprising that some flowers can be treats for our taste buds as well. lavender, lilac, mums, nasturtium, pansies, roses, sunflowers and violets, among others. Always check to make sure a flower is edible and, when in doubt, don’t eat it! It is important to proceed with caution because several flowers, such as azaleas, buttercups, daffodils, delphinium and wisteria, just to name a few, are poisonous. One very important thing that you need to remember is that not every flower is edible. In fact, sampling some flowers can make you very, very sick. You also should NEVER use pesticides or other chemicals on any part of any plant that produces blossoms you plan to eat. Never harvest flowers growing by the roadside. 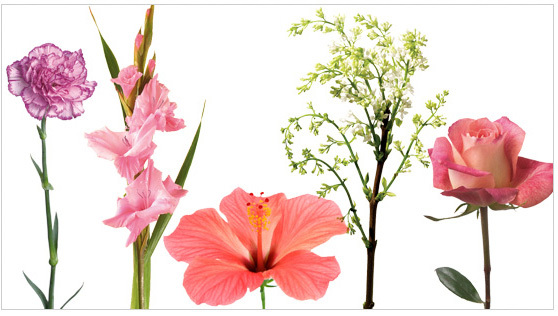 Identify the flower exactly and eat only edible flowers and edible parts of those flowers. A great place to start is with flowers from your own garden. That's because you know how they have been grown and you can be confident that they are entirely free of pesticides and chemicals. Do not eat flowers unless you are sure that they have been grown without the use of these substances. Pick your flowers at a cool time of day; morning is often best. Remove the pistils and stamen, and be sure to wash petals carefully. Also make sure there are no insects stuck inside your flowers. Carnations: Steep in wine, candy, or use as cake decoration. To use the surprisingly sweet petals in desserts, cut them away from the bitter white base of the flower. Carnation petals are one of the secret ingredients that have been used to make Chartreuse, a French liqueur, since the 17th century. Gladiolus: Flowers (anthers removed) have a nondescript flavor (taste vaguely like lettuce) but make lovely receptacles for sweet or savory spreads or mousses. 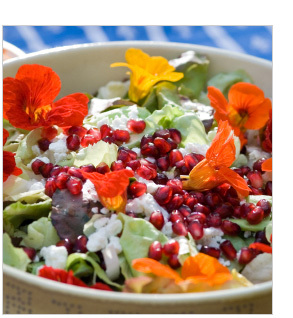 Toss individual petals in salads. Hibiscus: Cranberry-like flavor with citrus overtones. Use slightly acidic petals sparingly in salads or as garnish. Lilac: The flavor of lilacs varies from plant to plant. Very perfume-y, slightly bitter. Has a distinct lemony taste with floral, pungent overtones. Great in salads. Roses: Flavor reminiscent of strawberries and green apples. Sweet, with subtle undertones ranging from fruit to mint to spice. All roses are edible, with the flavor being more pronounced in the darker varieties. Miniature varieties can garnish ice cream and desserts, or larger petals can be sprinkled on desserts or salads. Freeze them in ice cubes and float them in punches. Petals can be used in syrups, jellies, perfumed butters and sweet spreads. Note: Be sure to remove the bitter white portion of the petals. For a few ideas on flowers you can use in cooking, we turned to Linda Stradley's website: What's Cooking America.These brief highlights were used with Linda's permission. For more information and recipes, visit her site.